Pfaltzgraff Patio Garden was the inspiration for this card. I saw the pattern in a catalog and thought 'that would make a great card'! 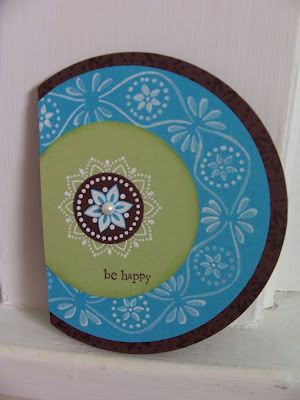 I've never made a circle card, but I kind of like it and will definitely do it again. I cut out my circles first. I used a wheel on the turquoise layer, inking it up with white craft and then just wheeling in a circle. It smears slightly and is a little distorted, but I think it turned out pretty good! I also took my white gel pen and highlighted and filled in the wheeled part. I sponged celery ink on the edge of the celery circle. The main image was stamped in versamark on the respective colors, embossed in white, cut out, and layered. I used a mini glue dot to adhere the halfback pearl to the center. You make the most amazing cards! What creativity! This card is beautiful! Hi Becky! Love your bonus challenge card... i just wanted you to know my other addiction, in addition to stamping and acquiring stamping stuff, is TABLEWARE!!! I cannot believe you linked those gorgeous dishes, forcing me to click on it! This is so pretty! I love this card and the colors!